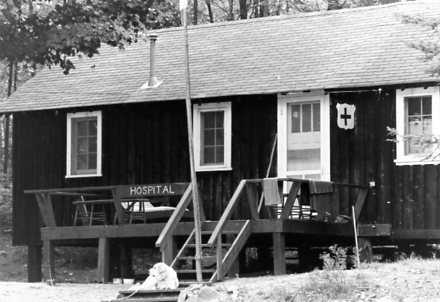 Although the building which became know as Pow Wow Lodge had been intended as a camp hospital in when built in 1948, a new building was constructed in 1949 with funds donated by the Scottish Rite Masons of Toronto and the J. P. Bickell Foundation. It was located at the “main end” just west of Kennabi Lodge. 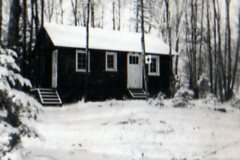 In 1956 the building was extended at the northwest end and eventually consisted of an examination room, and isolation room, a ward and a bedroom for the camp nurse, totalling 640 sq ft.
By 1985 a new Health Centre had been built farther west (north of the Beaver Campsite). The old camp hospital was converted into a residence and renamed Bayview Lodge. For many years it was used by Barb (75-87,92-99) and Ab Morrow (75-87,92-99). In 2011 it was essentially gutted and refurbished with new windows, doors and interior walls.